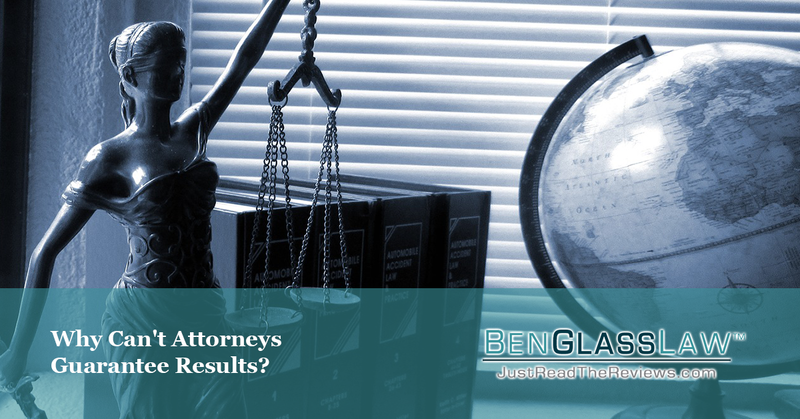 Why Can't Attorneys Guarantee Results? It's not ethically appropriate for an attorney to guarantee a particular outcome. When it comes to any particular car accident case there's simply no way to predict the outcome. There are too many factors to account for, and if your car accident case goes to trial you are subject to the judgment of the jury. How Do You Find Out How Much Your Case is Worth? If you've recently been injured in a car accident here in Virginia and are seeking legal counsel, you're likely wondering what your case is worth. It's a logical question, and there's no problem with you asking it. However, if you speak to an attorney who guarantees you a particular outcome in a case, you need to be very careful about bringing that attorney on as your representative. Now of course, based on the attorney's experience, he or she is allowed to give you their thoughts on potential ranges of what your case may or may not be worth. However, the truth is is that there's never any guarantee that you'll ever see $1.00 with your car accident case. That's because trials are imperfect, and unforeseen issues come up with cases that one would never predict at the outset. This isn't to say that you should not ask very pointed and specific questions about your case when speaking with an attorney. The attorney should also be able to provide you logical answers to the questions that you ask about the process, their involvement in your case, and other important elements of your case. Beware of the attorney that tells you they are going to get a whole bunch of money in a car accident without even having the opportunity to look at your medical records.